Distribution: Indigenous populations of landlocked Atlantic salmon exist in lakes throughout eastern Canada with scattered populations in Maine. Landlocked salmon are stocked annually in 15 waterbodies in New Hampshire, including Winnipesauke Lake, Squam Lake, Newfound Lake, and Sunapee Lake. Description: Landlocked salmon are Atlantic salmon found in freshwater lakes with no access to the ocean. Individuals are identical in appearance to sea-run Atlantic salmon, although they tend to be smaller in size. Habitat: Landlocked salmon populations are usually found in large glacial lakes with deep, cold water habitat in the summer and tributary rivers and streams for spawning. During the summer, salmon tend to feed just below the thermocline, which usually establishes at a depth of about 40 feet. Spawning takes place in rivers and streams with riffle/ pool habitat and gravel substrate. Life History: Landlocked salmon is a term for an Atlantic salmon population that has become isolated from the Atlantic Ocean. These freshwater populations occurred naturally in large, deep lakes that formed as the glaciers retreated. As rivers shifted course and lake levels decreased, some salmon populations were able to survive by spawning in the tributary rivers and streams that flow into the large lakes where they became trapped. 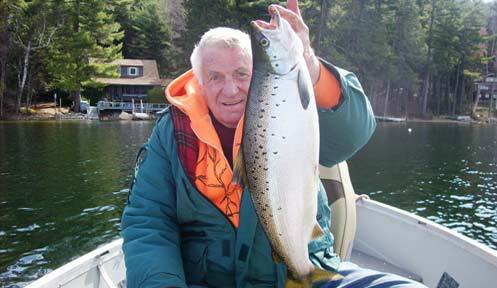 The closest example of an indigenous landlocked salmon population is found in Sebago Lake, Maine. Landlocked salmon populations in New Hampshire originated with Atlantic salmon transferred from the St. Croix River in Maine. These fish were planted in Newfound Lake in 1866 and then in Winnipesauke, Squam, and Sunapee Lakes in 1867. A number of New Hampshire lakes contain suitable cold water habitat for the species in the summer, but spawning habitat is marginal in the rivers and stream that flow into these lakes. Poor recruitment from natural spawning and heavy fishing pressure makes the use of hatchery stocks necessary to maintain a fishable population. Natural reproduction does take place in some tributaries, with the best examples of natural spawning runs occurring in the Cockermouth and Fowlers Rivers, which flow into Newfound Lake. Conservation/Management: Landlocked salmon are very popular with anglers and there are intensive efforts to manage the fishery. Adult salmon are captured in pound nets during the spawning season to provide a source of eggs for the hatchery. Salmon are stocked in lakes as yearlings at lengths between 4 and 6 inches. Yearlings stocked at larger sizes have a better chance of survival. Adult salmon are monitored using fyke and pound nets in the fall. These nets take advantage of the salmon's tendency to move along shore as they search for tributary streams to spawn in. All of the individuals from each cohort receive a specific fin clip so that annual growth can be assessed by capturing adults of known age. For example, if an adipose clip is used on yearling salmon before they were released as yearlings in 2014, then adults captured with adipose clips in 2016 would be 3 years old. Rainbow smelt are a critical forage species for landlocked salmon in New Hampshire. Smelt populations are monitored using dip nets during their spring spawning run and with a hydroacoustic survey conducted during the summer. Information on the size and abundance of rainbow smelt populations are an important factor in setting landlocked salmon stocking rates. Recently, the growing popularity of the fishery has resulted in an increase in the rate of hook wounding on landlocked salmon. Hook wounds can occur when salmon are repeatedly caught and released. While anglers are allowed to harvest 2 fish per day in most salmon lakes between April 1st and September 30th, catch and release rates are more difficult to manage through regulation. Accidental capture by ice fisherman, increased pressure from guided fishing trips, and poor year class survival can all contribute to an increase in the rate of hook wounding among the landlocked salmon population. As hook wounds heal they can result in deformities of the jaw, which may limit the ability of the salmon to feed. Fish with hook wounds show a significant decrease in growth compared to healthy fish of the same year class. The Salmon Pledge is an effort to promote responsible angling practices that will help reduce the rate of hook wounding and catch and release mortality. Catch and release rates, harvest rates, the forage base, and growth rates are some of the many factors that must be considered while managing the landlocked salmon fishery. Continue to monitor and manage landlocked salmon populations to support the recreational fishery. Early season anglers generally fish for salmon using live bait -- smelt, shiners and worms, from shoreline, docks and bridges. "My earliest recollection of spring salmon fishing was drifting a smelt under a bobber at the mouth of Black Brook in Lake Winnisquam," says Fisheries Biologist Don Miller. As the ice recedes and open water appears around brooks and bridges, one of the most popular methods to catch salmon is by trolling. Successful trollers use slowly presented smelt or shiners, or an assortment of lures including stickbaits (such as Rapala, Rebel, Yo-Zuri), spoons (Mooselook, Flash King, Sutton, Top Gun, DB Smelt) and various flash lures (Super Duper, Harry Lure, etc. In tributaries and rivers like the Winnipesaukee, fly-fishermen often have success working weighted nymphs, such as olive or black Woolly Buggers, various bead-head nymphs and heron flies. Other proven methods include fly-casting or trolling smelt-imitating streamer patterns, such as the Gray Ghost and its many variations, Nine-Three, Supervisor, Winnipesaukee Smelt and Maynard's Marvel.